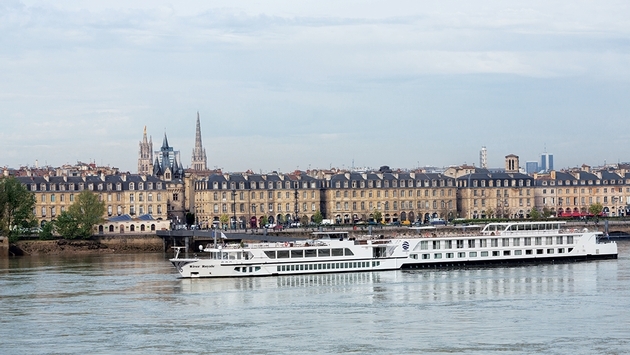 PHOTO: The River Royale offers culinary focused cruises round-trip out of Bordeaux. Culinary travel is hot. In fact, more than three-quarters of all leisure travelers, representing a whopping 131 million Americans, consider themselves foodies, according to the World Food Travel Association’s American Culinary Traveler 2013 report. Indeed, 30 percent (roughly 39 million people) said they were deeply influenced by culinary activities when selecting their destinations. So perhaps it’s no surprise that many river cruise companies are turning their attention to the culinary market. For Uniworld Boutique River Cruise Collection, food and wine have always been staples in its portfolio, but the upscale river cruise line’s Bordeaux, Vineyards & Chateaux itinerary onboard River Royale truly hits the mark for all things culinary. Introduced in April 2014, the seven-night program sails roundtrip from Bordeaux, France, through the Aquitaine region’s three rivers, which include the Garonne, Dordogne and Gironde. These particular waterways, with their occasional strong currents and low bridges, can present a challenge to some ships. Not so with the 361-foot by 37.5-foot River Royale, which was repositioned here from Provence and has already proven to be a perfect fit for the itinerary. The ship was lightly refurbished before beginning its new itinerary. The Internet café on the Bordeaux (mid-level) deck was transformed into the new and very popular Claret Room. The gift shop was relocated across from the former Internet café to the lounge of La Gironde (upper) deck, making way for a cozy coffee and tea bar called the Blues Café. The line also added the multipurpose Blue Fox Café on the sun deck. Beyond making physical changes to its product, Uniworld introduced an all-inclusive policy across all ships in Europe in 2014. 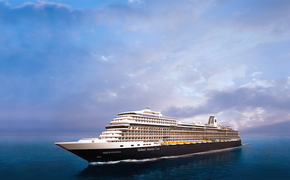 Except for a handful of optional fee-based activities, everything is included in the cruise fare such as all gratuities onboard and onshore; unlimited beverages onboard, including an extensive selection of distinctive wines, craft and regional beers, spirits, cocktails and nonalcoholic beverages; shore excursions with local experts; free Wi-Fi Internet access; and arrival- and departure-day transfers. Accommodations: River Royale, which entered service in 2006, carries 130 guests in 64 staterooms and one suite on three passenger decks. The 215-square-foot suite, located in the stern of the ship on the La Gironde (upper) deck, is decorated in light and airy French blue and white. It features separate rooms for the toilet and the shower, three sinks and vanities, an expansive French balcony and several other special amenities and services. Decorated in the same color scheme as the suite, the 26 staterooms (Category 1) on the upper deck each measure 140 square feet and have French balconies. The 38 staterooms on the Bordeaux (Category 2) and La Durance (lower level, Category 3) decks measure 151 square feet and are tastefully done in an understated red brocade and fresh and open champagne stripe, respectively, with either full-picture or porthole windows. 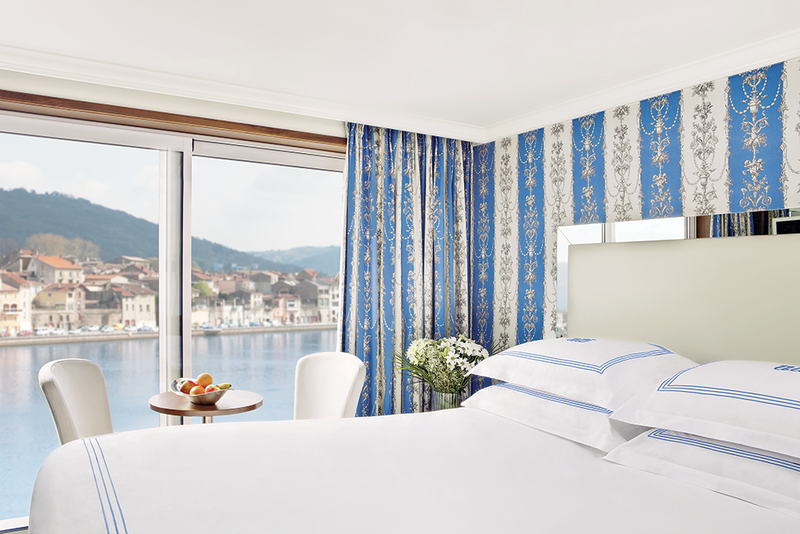 All staterooms feature handcrafted Savoir of England beds fitted with Egyptian-cotton linens, down-filled duvets and a choice of five pillow preferences. Staterooms have a built-in closet with a full-length mirror, a safe, individual climate controls, a hairdryer, a flat-screen television with an infotainment center and bottled water replenished several times a day. Bathrooms feature upscale L’Occitane en Provence products, plush towels, luxurious bathrobes and slippers. Electric outlets, including one super convenient 110/220 volt, are located throughout each cabin. All staterooms are smartly designed to provide guests with a comfortable living space and more-than-enough storage. PHOTO: All staterooms feature handcrafted Savoir of England beds fitted with Egyptian-cotton linens. Public Spaces: Uniworld has paid great attention to detail in River Royale’s common areas. The museum-quality artwork, attractively displayed throughout the ship, is sure to impress guests. The near-wall-size colorful mosaic depicting a French countryside in the reception area creates a warm and colorful entrance. The ship is equipped with an elevator. With the itinerary offering unlimited beverages, one would expect the Aquitaine Bar and Gascogne Lounge to be quite crowded and noisy, especially late afternoon into the evening. Not so on the River Royale, although there certainly is a nice buzz going on. While some guests prefer the striped upholstered high tops situated around the bar, the balance of the spacious lounge features small seating clusters complete with cream-colored couches, comfy red-leather barrel chairs and the like. 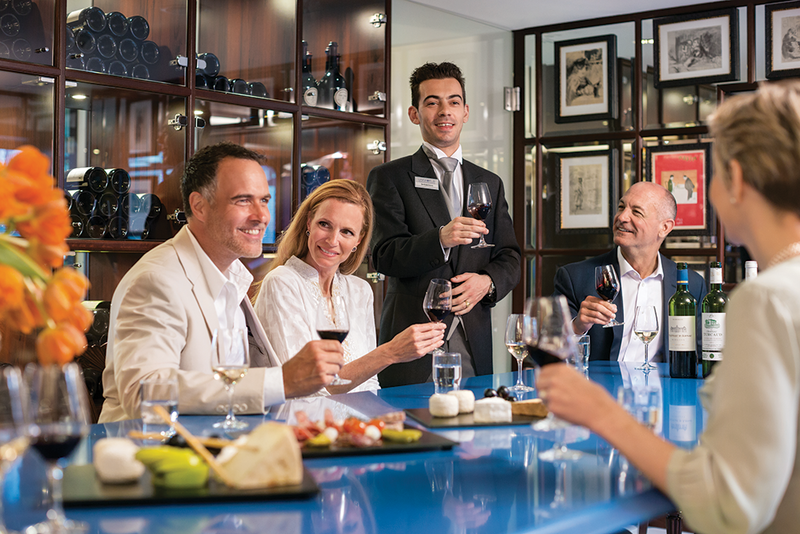 The Gascogne Lounge also is the hub for many of the onboard lectures, culinary demonstrations and daily port talks. The coffee and tea bar is open 24/7, and also serves pastries and fruit for early risers and late diners. The sun deck is another favorite retreat for guests. The large deck features a spa-tub and comfortable chaise lounges and tables in both shaded and open areas, making this an attractive draw throughout the day and evening. Adding to the deck’s popularity is the recent addition of the Blue Fox Café, which, weather permitting, serves light lunches (cold salads and seafood, pizzas, grilled meats and veggies). Guests can dine inside the Blue Fox or al fresco at one of the white ironwork tables surrounding the lounge. Dining: River Royale’s diverse and extensive menu — cooked by a talented kitchen staff — truly elevates the dining experience at every meal in Le Bordelais Restaurant, where local ingredients and regional specialties are standard fare. For breakfast and lunch, guests can choose from an extensive buffet of hot and cold dishes and pastries, plus a special or two at each meal. Drinks are served at the table, including champagne for breakfast, and wine, beer and cocktails for lunch. The nightly table-service dinners, which are two-hour, minimum four-course affairs, are as beautiful to the eye as they are divine to the palate. For the entrée, guests can choose from a selection of savory meats and fresh fish or several alternate options. Each course features a food and wine pairing, often showcasing local ingredients and vineyards of the area. Midweek, guests are treated to a gastronomic event created by Philippe Etschebest, a two-Michelin-star-rated chef from Saint-émilion. A “Traveling Lite” menu also is offered for a lighter fare of dining options throughout the cruise. Seating and arrival times are left up to each guest. Dinner in the Claret Room is another great option for 12 passengers each night. Guests are treated to the same multi-course meal from La Bordelais Restaurant with a few surprises often complementing the food and wine experience. The Claret Room is complimentary and books up almost immediately, so reservations must be made at the reception desk. PHOTO: The Claret Room is a popular spot on the ship for wine tastings and special dinners. Spa and Fitness Center: The Serenity River Spa, sauna and fitness center are located on the upper deck near the stern. The fee-based spa offers an array of treatments, including Thai chair or classic body massage, hot stone, sheer bliss wellness and women’s beauty applications delivered by professional massage therapists using Rituals products. The complimentary fitness center, framed in nearly floor-to-ceiling windows, is equipped with a variety of cardiovascular equipment and weights for an overall workout. In addition, yoga is offered at 7 a.m. daily upstairs in the Blue Fox Café. Itineraries and Tours: Ports on this itinerary include Bordeaux, Pauillac, Libourne, Saint-émilion, Bergerac, Blaye and Cadillac. Vineyard visits, wine tastings and food pairings are at the heart of the complimentary daily excursions led by knowledgeable guides from the local area. An advanced understanding of the viticulture is not a prerequisite on this cruise. Guests who can get the most out of the Bordeaux experience are inquisitive, curious and willing to sample things outside of their daily routine. Among the excursion highlights are a walking tour and wine tasting in Saint émilion and evening panoramic bus tour of Bordeaux. Several culinary-inspired activities are also available for a fee with the half-day cooking lesson and meal at the Grand Hotel de Bordeaux & Spa, part of the Leading Hotels of the World, most certainly a standout. Guests have at least 10 excursions to choose from, as well as plenty of free time to explore using free bicycles and Nordic walking sticks, or they can simply relax on the ship. For more information or reservations, call 800-257-2407 or visit www.uniworld.com.